As a continuation of our Application Behaviours Tutorial, this tutorial shows how easily OMNIA can use and combine information from different data sources. In order to understand how this works, please read this section of the documentation. On the first tutorial area (CRUD Operations), we are going to evaluate how to interact with an external data source, by reading and manipulating its data. On the second area (Add Employee Selection to Purchase Document), we are going to focus on the application of the new developed elements to our existing document, to mimic a real world scenario of attribution of a document to an employee. As our custom data source, we are going to use a free API named ReqRes, that simulates real time CRUD operations, based on a user management scenario. Please notice that, since this is only a simulation, no actual data is manipulated (written, updated or removed) on REQRES’s system. However, the code shown will be easily convertible to real-world scenarios. Through the left side menu, create a new Data Source by accessing the option Data Sources / Create new on the top right side. 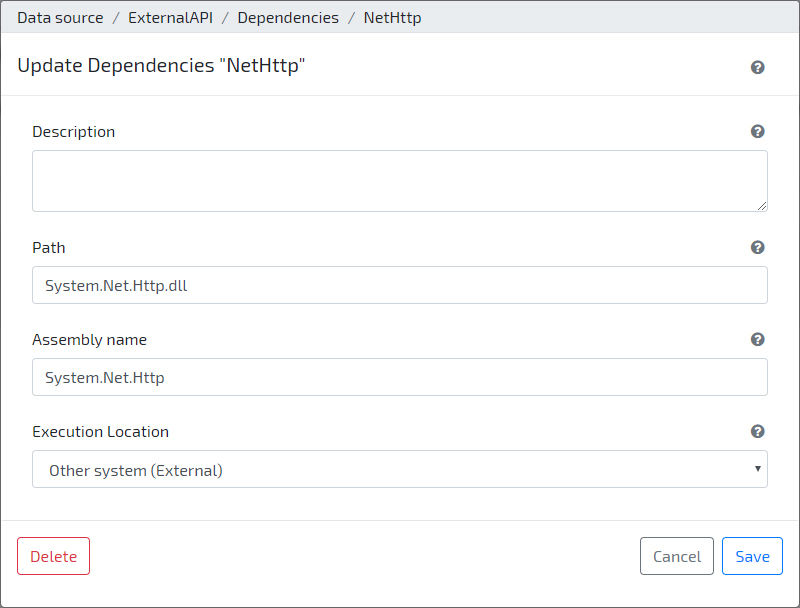 Set its Name as “ExternalAPI”, Behaviour Runtime as Internal and its Data Access Runtime as External. Leave it as not requiring a connector. 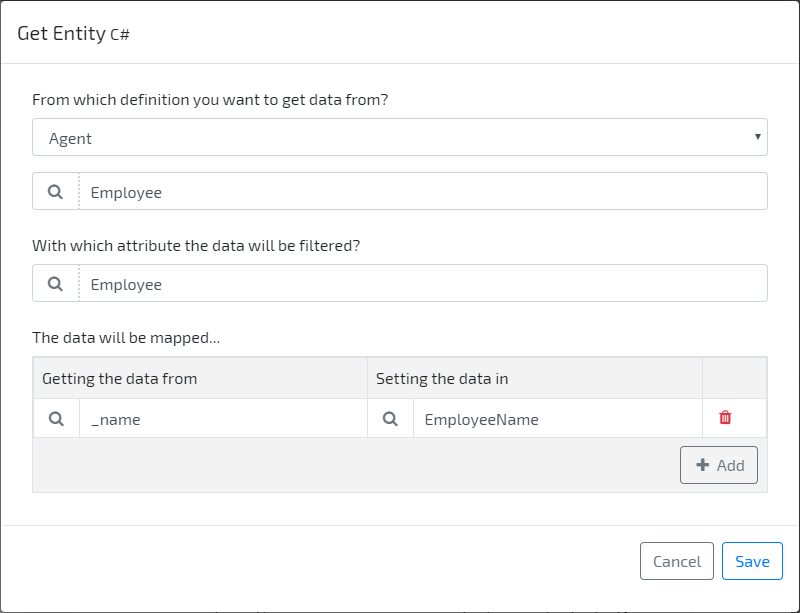 Create a new Agent with Name “Employee”, and set it as using the external data source “ExternalAPI” that you created earlier. NOTE: in this scenario, we are ignoring the query sent by the user when obtaining the list. In real world scenarios, you will want to change the query to the external system and/or the returned response, according to the parameters sent by the user. 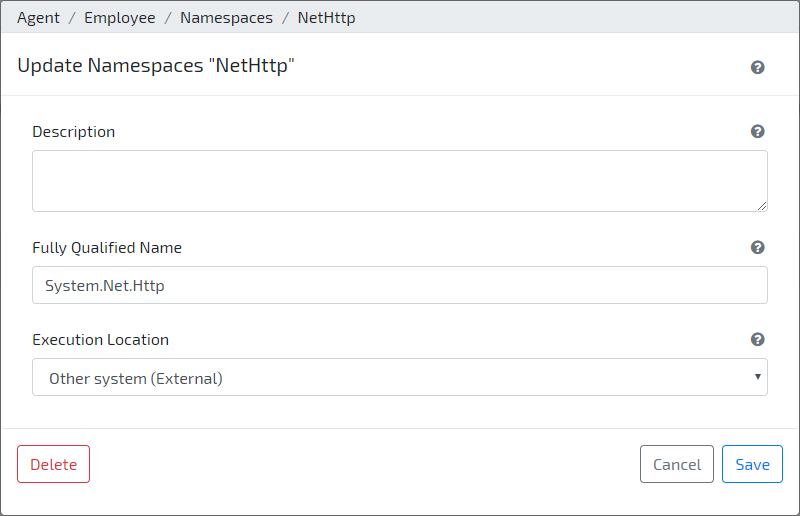 On Application area, create a new instance of the ExternalAPI data source, with code “ReqRes”. On left side menu, navigate to Configurations / Employee, and check that the list is filled with data retrieved from the external data source. Now that you know how to use Data Sources, we recommend you to take a look at this tutorial where you will learn how to expose an on-premise Data Source to OMNIA.